Democrat love their poll. They believe in them like Christians believe in God. Well polls after polls have showed that More Americans believe the media that is has democrat bias is the reason behind the divisiveness and chaos in America. For the uneducated it means more Americans think the media is behind the cause of the chaos and divide in the US. When it comes to independent voters, 67% blame the media, 54% blame Trump. Yes, more Democrats than Republicans blame Trump for being politically divisive. But 50% of Democrats also blame the media for being politically divisive. So there’s that. I believe is a none aligned news outlet. More trustworthy than fox or cnn or any of the aligned networks. @visafree the truth shall set you free and out of the democrats plantation. Thanks the media for this. This is what happens when they churn out Trump news 24/7. It only helps him. No man.. you got it all twisted, like I said, trump is , you know what is Trump doing ? is Putin's job for Putin.. Democracy is in jeopardy. exactly what putin always targeting to bring the USA down from the international arena.. Once a leader always a leader.. but not with Trump and the republicans.. There is no such thing as democrat controlled media?. The media is a privately run organization, and the government from both parties have no controlled of what the do or say, its a neutral organization that keep the government at pay. the only fake news are the ones that Trump likes , like the fox, who lied like the President.. BTW the poll shows majority of american believe in special counselor investigation and this is not fake news..
@visafree, the U.S media is owned by the Democrat party. 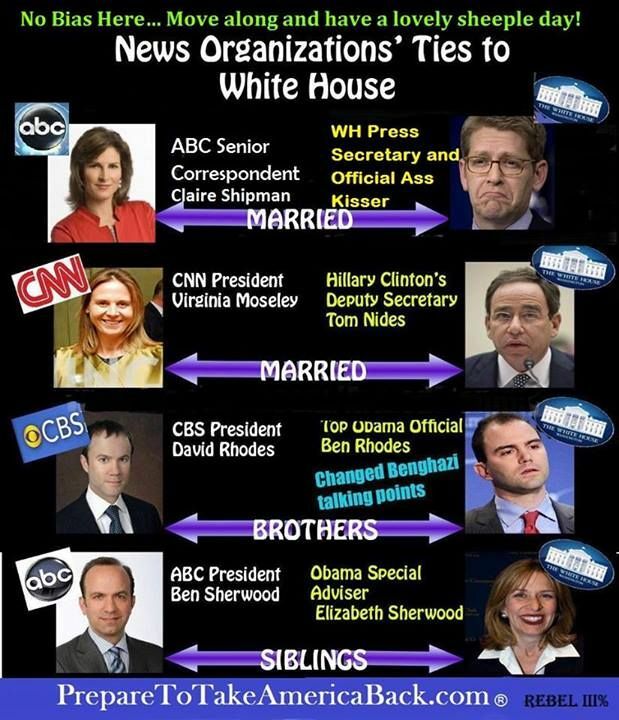 The major news networks are controlled by Democrats. CNN, ABC, NBC, MCNBC, VOX, Washington Post, New York Times, Bloomberg Media, Politico, Motherboard, Vogue, Times magazine, HAWAII News Now, Civil Beat. All lean democrat and controlled by Democrats. All of Obama's former officials are all now working in the top anti Trump media in America. Even the medias own liberal leaning Polls shows 62% of American think and believe the mainstream media is controlled by Democrats. A more simpler explanation can be had in one word - Jews. There were many flips flops between the two parties, democrats flips republicans and vise verse, but the fact remains, that Rules of laws and democracy process had been destroyed by this Authoritarian and white Nationalist Trump Admin, that's why people are outrage majority of the people, I mean..
Ghe outrage is only from democrats. They can't get over 2016.